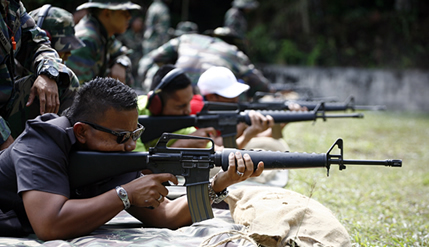 BANGI, 4 Nov 2013 – For the first time, civilians took part in a marksmanship competition alongside officers of The National University of Malaysia (UKM) and Universiti Sains Islam Malaysia (USIM) Reserve Officers Training Unit (ROTU) cadets. Some 60 reserve officer cadets from the two universities and 40 spectators participated in the the shooting contest, organised by the Royal Malay Regiment (RAMD) here today. The training of USIM’s reserve officers are being undertaken by UKM. Head of the UKM ROTU Training, Lt Col Mohd Sahar bin Haji Said said this was also the first time that non-military UKM staff were invited to witness the UKM and USIM event. He lauded the enthusiasm shown by the civilians describing the exercise as encouraging. Among the participants were Vice-Chancellor, Prof Tan Sri Dato’ Seri Dr Sharifah Hapsah Syed Hasan Shahabudin, who is Commandant of UKM ROTU and staff of the various faculties, centres and security guards. Deputy Vice-Chancellors (Students and Alumni Affairs), Prof Dato’ Dr Ir Othman A Karim and (Academic and International Affairs), Prof Datuk Dr Noor Azlan Ghazali also took part. Before the informal competition, the civilians received a crash course in shooting the M-16 rifles with 10 rounds of ammunition each to shoot at cardboard targets 25 metres away. The non-military members were charge RM10 each for the 10 rounds of ammunition. In the contest, participants were divided into 16 groups of four each with mixed military and civilian members. The match was held in a knock-out format with each winning team going on to the next round until only two groups remained for the final. Each participant were given 5 rounds of ammunition and were required to knock down 9 plates. The first group that managed to knock down the most plates before the ammunition ran out went on to the next stage. Eventually, a group made up mostly of UKM security guards emerged the top team.